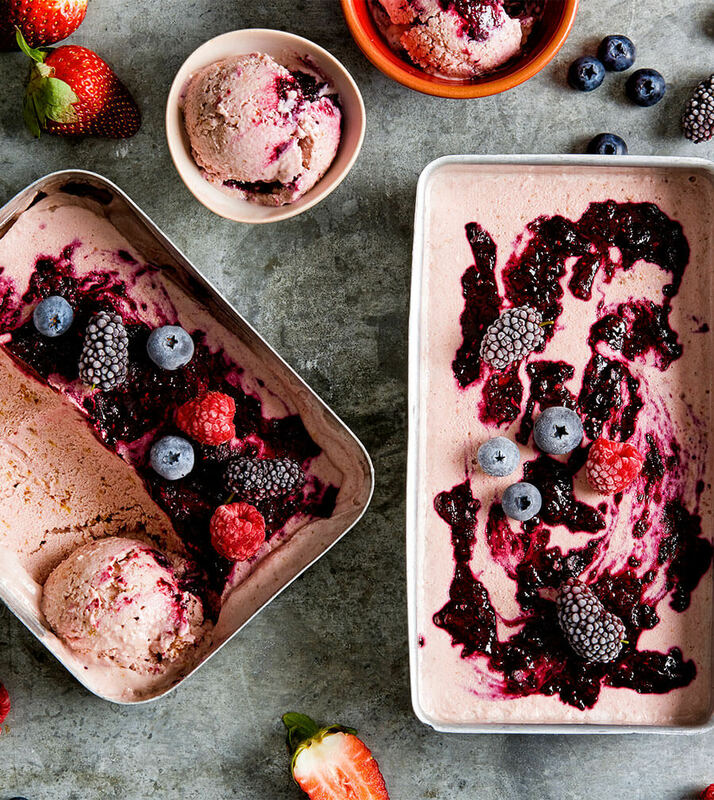 This pretty ice cream is deliciously creamy and easy to make – no ice cream maker required! In a medium saucepan, stir together the berries and maple syrup over medium-high heat. Bring to a rapid simmer, reduce the heat to medium-low, cover, and cook for 8 to 10 minutes or until the fruit breaks down, stirring occasionally. Scoop out about 1/4 cup of the mixture and whisk in the arrowroot starch. Return the mixture to the pan, reduce the heat to low, and continue to cook for 2 to 4 minutes or until the sauce thickens, stirring constantly. Remove from the heat and use the back of a fork to mash any remaining berries into the sauce (it’s okay if there are small bits of berries). Line a freezer-safe loaf pan or container with baking paper. Pour about half of the ice cream base into the lined pan and drizzle with the berry swirl. Use the pointy end of a chopstick or a toothpick to gently swirl into the ice cream base. Top with the remaining ice cream base and drizzle the surface with the remaining berry swirl. Again, use a toothpick or chopstick to gently swirl the mixture into the ice cream base. Loosely cover with plastic wrap and freeze for at least 6 hours, or until the ice cream is set. Let stand at room temperature for at least 15 to 20 minutes before scooping or serving. Dip an ice cream scoop in hot water and use it to scoop the ice cream. Tip: Store in the freezer, loosely covered, for up to one week. *Community Co products are available from your local IGA store.